Base and salt light together measure 4 1/4” H x 3” W x 3 1/2” D and weigh 15.6 oz. 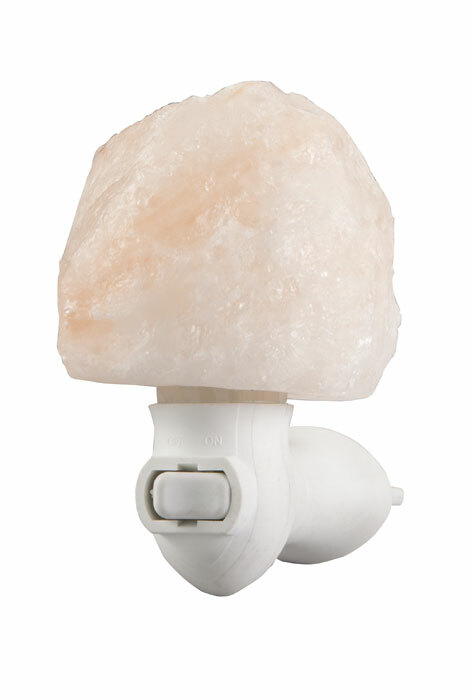 Rejuvenate from head to toe with the serene, warm glow of an authentic Himalayan salt healthy night light. Originating from brine deposits left by ancient Himalayan oceans, this naturally carved salt rock lamp is a compact night light size. Salt lamps help purify the air by emitting a stream of negative ions that bind to positively charged dust particles, bringing irritating particles to the ground and leaving the air fresh. Negative ions are odorless, invisible molecules we inhale in many natural outdoor environments, which are believed to increase levels of the mood chemical serotonin and boost daytime energy. Negative ions may also help control pollen, dust mites, smoke, mold spores and pet dander in the air. The lamp’s inviting, calm amber glow provides light therapy that helps reduce stress and increase energy. Individually crafted and unique, this lamp has a hollowed-out core with a low-watt bulb. Base adjusts 360 degrees for horizontal sockets and has an on/off switch. Useful in every room, from dark hallways to kitchens, bathrooms and offices. I absolutely love my Himalayan salt night lights. I have several Himalayan salt lamps in our house . I feel they are mood elevating and helpful with sleep. I also put one in our basement bedroom to help prevent excess moisture. I was so excited to see that now I could purchase them in night lights. I purchased two and put them in a dark foyer hallway. They give off the most beautiful glow. I will be ordering more. I have been using SALT lamps for some years but this is the first night lite. Many beneficial properties! 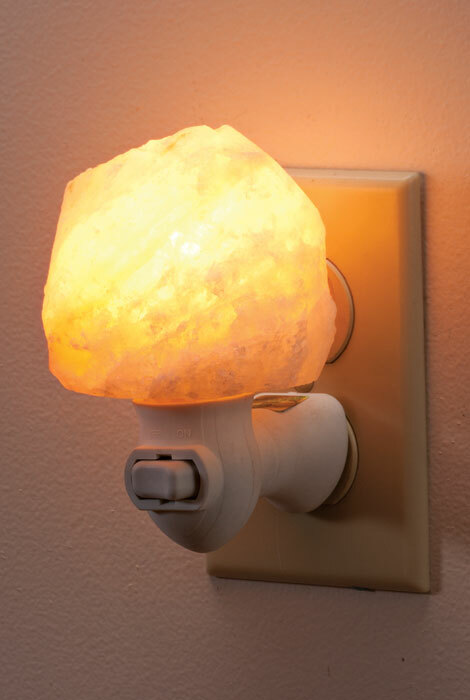 Have several larger Salt Lamps in house but would like this one in bedroom. Want to see if these work as well as claimed. I have standard sized Himalayan Salt Lamps and I love them. This is the first time I have ever seen them sold as night lights. We have the larger one and this is nifty. Heard about them and want to try it.